Soldiers of Princess Louise's Argyll and Sutherland Highlanders infantry regiment, 10th Canadian Infantry Brigade, 4th Canadian Armoured Division, ride a Ram Kangaroo of B Squadron, 1st Canadian Armoured Carrier Regiment, 79th Armoured Division. This is a late model Ram Kangaroo. Note the jerry cans and other gear stowed on the hull. The 4th Canadian Armoured Division had just liberated Almelo on April 5th and are moving to the German town of Werlte. The Canadian-built Ram Kangroo was a replacement for "defrocked" Priests - M7 105mm Howitzer Motor Carriages with the gun removed. 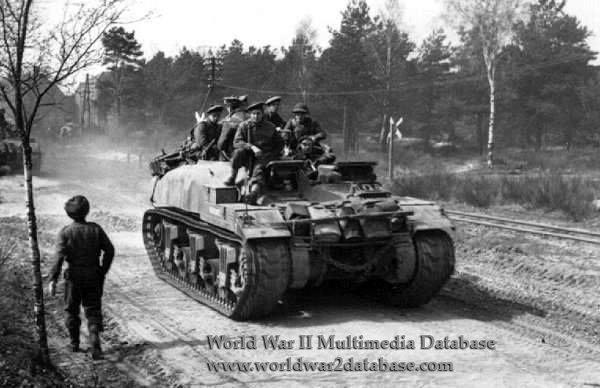 When the M7 Priests were returned to the United States in September 1944, the Canadians turned to their own Ram tanks. The Ram tank was obsolete as a main battle tank, but the application of infantry deployed from armored fighting vehicles (AFVs) during the Battle of Falaise in August 1944 was so successful, the Rams were pulled from storage in England, their turrets removed in the field, and two Armoured Personnel Carrier Regiments - the 1st Canadian and the 49th British - were equipped with 106 Ram Kangaroos each. Each Ram Kangaroo had a machine gun and could carry eight soldiers. The use of infantry able to be somewhat protected (the Kangaroos lacked overhead protection) vehicles capable of keeping up with the tanks solved the problem of heavy infantry casualties on approach to the battlefield, which neither the Canadians or the British could afford. From September 1944 until the end of the war, the Ram Kangaroos carried Allied infantry to the battlefield. The Kangaroo was the forerunner of today's modern AFVs.